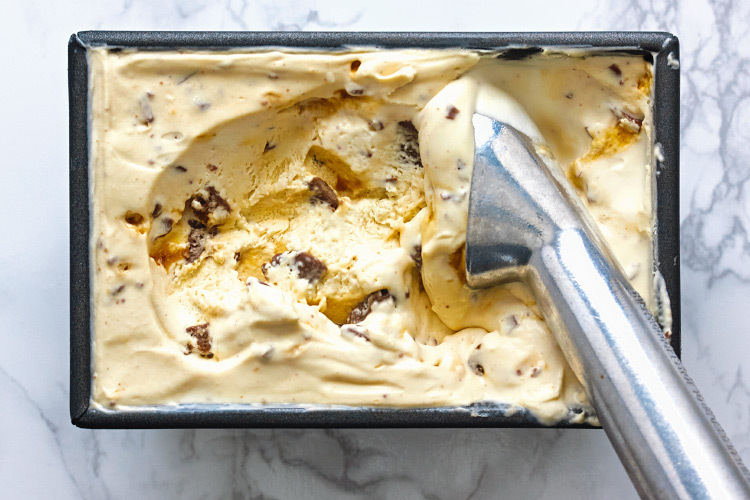 This homemade no-churn ice cream is a simple but still deeply decadent treat. I make it when I want creamy, cold, full-tilt sweetness, which makes it a good dessert after something hot and spicy. It’s very rich, so I’ll usually only offer up a heaping scoopful in an espresso cup and it’s plenty enough. The chocolate-covered honeycomb I smash into the ice cream is a Crunchie bar, a corner-shop favourite here. If they’re not a thing where you live, substitute your local equivalent. Good quality maple syrup, with its lovely caramel tones, has a very low water content, which is useful in this recipe because it doesn't freeze, keeping the ice cream soft and scoopable even straight from the freezer. It's very fast to make - 10 minutes, max – so you can easily whizz it up in the morning and leave it to set in the freezer all day, or make it days in advance if you want – and you have the willpower to resist its siren call. Makes 1 litre (2 pints). Slip the Crunchie bar into a plastic bag, cover with a tea towel and smash it up with a rolling pin or other heavy implement. Break it down until you have reduced most of it to dust, with some nubbly bits remaining. Set aside. In a mixing bowl, whip the cream until soft peaks form. Add the condensed milk and mix until combined. Add the maple syrup and beat briefly to incorporate. Finally, fold in the bits of Crunchie bar with a spatula. Pour the mixture into a 1 litre (4 cup) container and cover with a lid or foil. Transfer to the freezer for 6 hours to set.